Jerome Reuter is becoming ever more prolific in recent times and you may remember last year’s Die Æsthetik Der Herrschaftsfreiheit was a surprising addition to his catalogue in that it was a triple disc album that flowed with majestic coherence and innate boldness. Hell Money was quietly announced yet the shock that was felt by fans in the release of brand new material so soon after the massive undertaking that was Die Æsthetik Der Herrschaftsfreiheit was tangible in its anticipation for what was to come. The announcement was laden with promises of something new and unheard of from the Rome project, that Reuter was taking what we had all expected and turning it into something different and wildly out of reach. 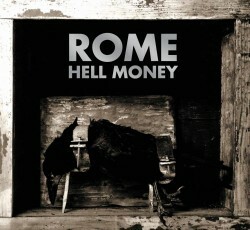 Hell Money is most certainly a Rome record, yet it differs in its simplicity and the sparse use of instrumentation. Jerome Reuter’s voice has always been the focal point of any Rome release and here he uses it to full and emotional affect. Again, this album is one that is based in concept but this time around it is one that is much closer to the heart and does not take it’s significance from struggle and oppression and war. At least, not in the most literal sense. There is struggle and war and fight in Hell Money but it is much more personally rendered. There’s always been a little and hidden hint that a lot of Rome’s work incorporates the ideals of love and it’s subsequent breakdown and Hell Money is defiantly an album filled with odes and laments to the desperation of relationships. Of course there’s also throws to a broader subject and Hell Money itself could be an allusion to the corrupt world of modern life, the economy and the tribulations of the current global situation. However, the absolute despondence heard in “This Silver Coil” instantly evokes feelings of true and utter hopelessness and Reuter’s vocal stance is one of cleanliness and purity and his words echo with melancholic gloom whilst pulling at those all-important heartstrings and heading deeper into the unknown and oblivion. The confessional nature of Hell Money pours itself into each and every track, with the middle of the album much more stripped back in order to allow these words of truth and reality to slip into the cracks left by the gentle strikes of acoustic guitar. Synths and drums and samples are noticeable by their absence in this release (expect for the intrinsically neo-folk style of “Golden Boy” – a delicious high point) and whilst it may take a little getting used to, the moments of stark clarity that the near silence produces are beautifully gloomy. “Amsterdam, The Clearing” holds a stubborn and stuttering melody that leaves seconds of complete quiet in the latter stages of the song whilst “Tightrope Walker” comes in waves of subtle and sensual tones, it’s message one of festering spite below the gorgeous climbing harmonies. Reuter is a clever songwriter and his words are always cloaked in meaning, whether we pick up on them or not. This may be something that many find difficult about Hell Money as a whole, in that it’s not a deeply obvious narrative on a period of great movement, but isn’t life itself one of the greatest struggles? It’s these questions that Hell Money opens up that makes it so sublimely resonant. It’s in the calm waves of sound that carry the heart to places that Rome has never quite travelled before and it’s in the acknowledgments of shame that Jerome Reuter becomes a man of merit (which is not to say that he wasn't before, but this record is one that is affecting in its total truth). Before he spoke about others, today he speaks of himself. Hell Money is the most human record of Reuter’s short but expansive career and the most inherently sorrowful music he has produced. And for that we should thank him. Posted Dec. 31, 2012, 4:57 p.m.